How Not to Be Seen is a video by artist and critic Hito Steyerl. It presents five lessons in invisibility. The video is divided into distinct but interrelated sections: 1. Make something invisible for a camera, 2. Be invisible in plain sight, 3. Become invisible by becoming a picture, 4. Be invisible by disappearing, and 5. Become invisible by merging into a world made of pictures. In 2017, and 2018 respectively, Steyerl was placed number one, and number four in Power 100 list published by ArtReview. It is arguably the most influential list of powerful figures in the contemporary art world. As a female philosopher and theorist, her visual art practice can be viewed as a warm gesture to reach out to audience and contemporary culture. Paying tribute to a namesake episode in British surreal comedy Monty Python, first released by BBC in 1960s, it adopts a similar wry sense of humor. It uses an authoritative tone of the voiceover, a “god’s eye view”(Steyerl, 2011, P2) similar to google map, and absurd instructions on disappearance such as “living in a gated community”, “being a woman over 50 years old” or “reducing oneself to a single pixel on screen”. Steyerl attempts to develop a language, while balancing humor and critique, direct audience attention towards the politics behind digital image. To do so, Steyerl draws from metatheatrical practices, such as “”Breaking the fourth wall”. In Marvel series, Deadpool is well-known as a character that likes to “breaks the fourth wall”. In this poster, he is shown breaking through a page of the comic, in a playful expression squinting his eye while looking directly towards the audience. 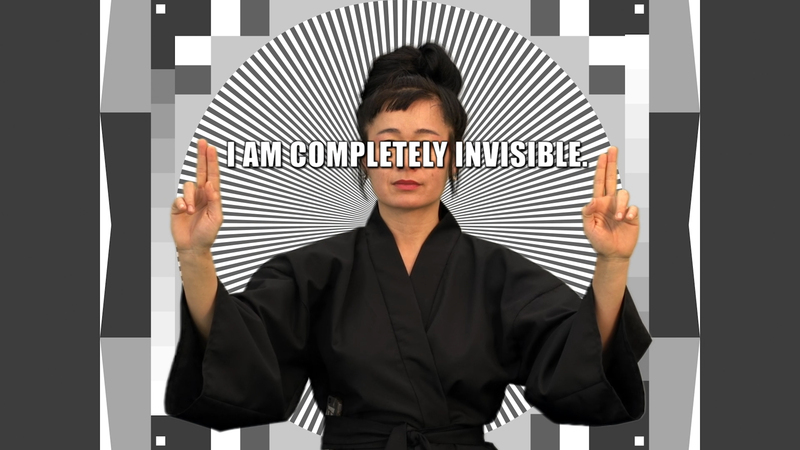 In her video, Steyerl reversed the direction by wearing a black outfit, standing still in front of a grayscale TV screen, and pretending to be “completely invisible”. In front of today’s omnipresent digital gaze, is it possible to not be seen? Should we wish not to be seen? Or perhaps more confusingly, how can one tell apart one’s own answers, from answers of family, friends, loved ones, or “negative feedback”(Wiener, 1948) delivered through digital images that we are constantly exposed to? To answer this question, Steyerl used a painting made in 1841 by painter J,W. Turner’s Snow Storm—Steam-Boat off a Harbour’s Mouth making Signals in Shallow Water as a metaphor. Questioning the objectivity of a stable horizon, it is said that Turner famously tied himself to the tip of a mask of a slave ship in the midst of a storm. Inspired by this destructively exhilarating experience, Turner reinvented a new space, time, and perspective, that conveyed the duality of ruin and rebuild, abandon and love, surrender and passion, corruption and liberation, suffer and embrace, a condition that turns the observed into observer and vise versa. One emerges from such a storm, regaining the power to notice a new horizon. Similarly, Steyerl invites audiences consider new media technologies such as surveillance drones, AR, VR, video game controller as a digital storm – an invitation to reexamine audience’s reliance on a “linear perspective”(Steyerl, 2011, P4 ) – being told to focus on a specific vantage point, from a specific angle, go through a series of plots according to a predefined order, based on a stable, predefined horizon. In an article for e-flux named In Free Fall, published in 2011, Steyerl invited readers to consider a thought experiment of Free Fall: “Imagine you are falling. But there is no ground”(Steyerl, 2011, P1). The disorientation of a free fall can be experienced through confusion of the self and reference points, such as others, things, and a stable horizon. The helplessness can make one question old forms of sensing and feeling, subject and object. In the video, there was a brief moment when Steyerl used her hand to cover up the camera screens, suggesting that one can avoid being subjected to a digital gaze, by first being aware of one’s own power to see. The place we are falling towards may no longer be “grounded”(Marchart, 1997) But falling does not only mean falling apart and broken. It can also mean the formation of a new awareness. Wiener, N. (1961). Cybernetics, or control and communication in the animal and the machine (2nd ed.). Cambridge, MA, US: MIT Press; Hoboken, NJ, US: John Wiley & Sons Inc.